This is what happens when the "Great American Novel" goes awry. 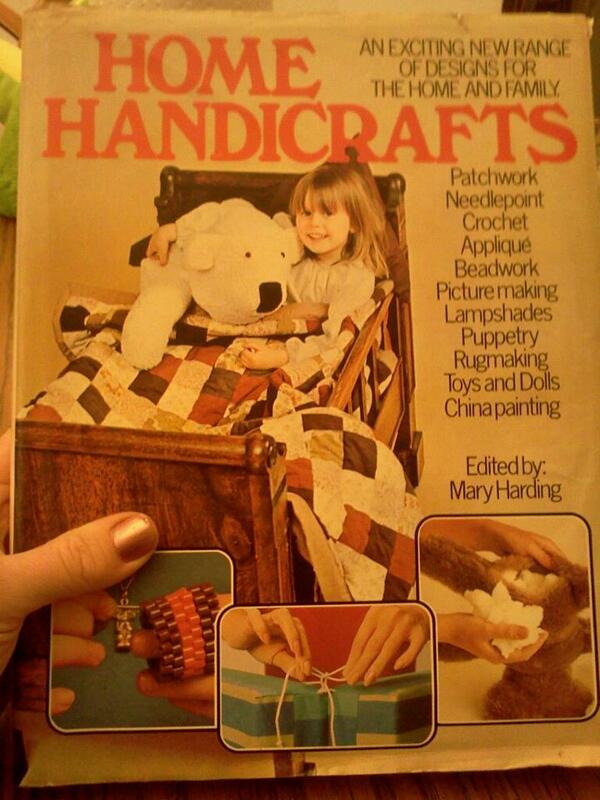 Nineteen Seventies Craft Book. Enough Said. From the era of macrame, puppetry and shrunken apple heads, it’s no wonder that every craft book I find from the nineteen seventies reflects artwork that would be only be available today in the home arts wing of a museum of the grotesque. If there was such a thing. I can’t see these objects ever being considered priceless folk art on a future edition of Antiques Roadshow. But what do I know? As a child of the nineteen seventies, I had to endure this time of burlap, felt and corkboard, for crafts and home decor alike. And that was some good living! But I digress. The book I found as my third homage to the trees of yore, is just an average craft book from the nineteen seventies. Pretty much any one would do. Through each hideous and horrifying page I turned I channeled in the spirit of a mighty oak, a whispering pine, a weeping willow – whatever it was that gave its life for this book to be published. This solemn experience made me want to weep. Things really hit the ground running with this book. Most of these pictures of horrifying crafts projects speak for themselves – but I’m not one to keep my thoughts to myself. 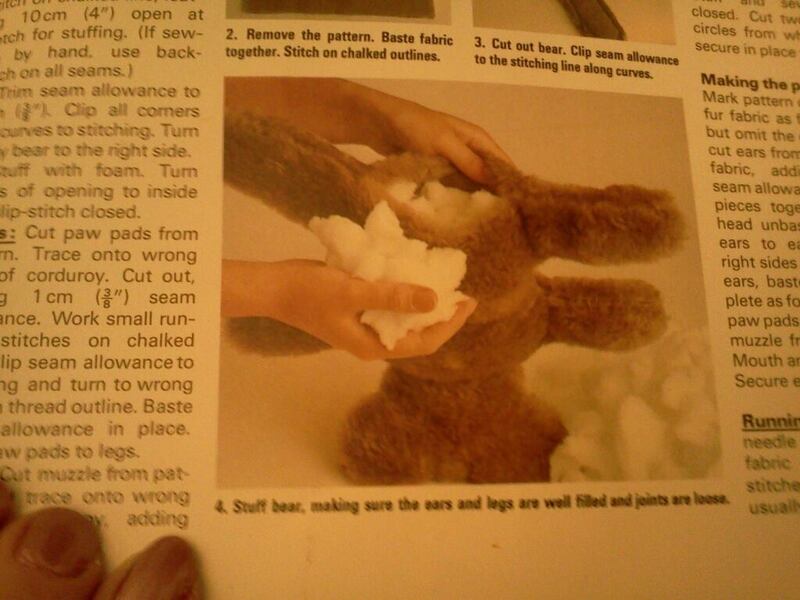 In the photo of the first craft project we see two terrifying bears sure to give nightmares to any youngster they’ve been foisted upon. 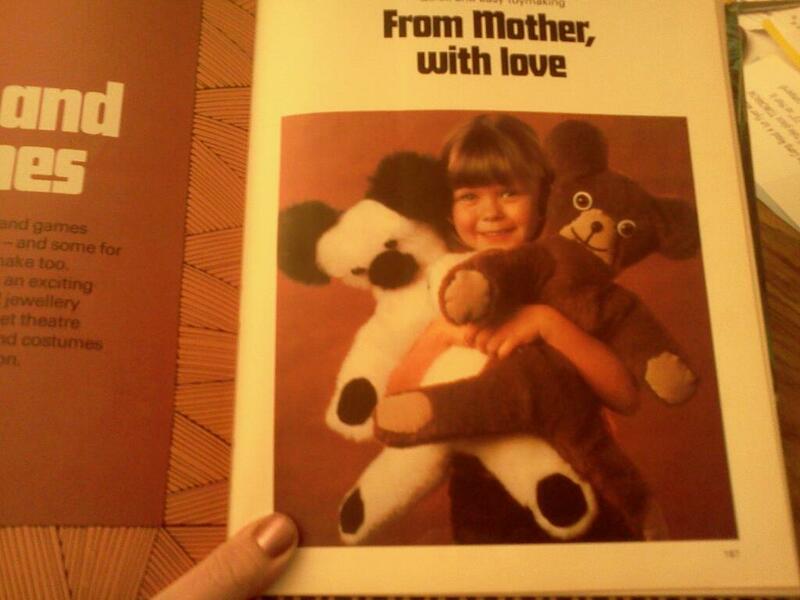 Even the sweetly captioned “From Mother, With Love” seems more like a threat. Alfred Hitchcock would certainly agree, in my opinion. Here we see a completely inappropriate and unnecessary bear stuffing. Vile and nightmare-worthy. Gratuitous? Perhaps. Otherwise, why not the arm pit? After awhile, the nightmarish photographs contained within this book sort of blur together. 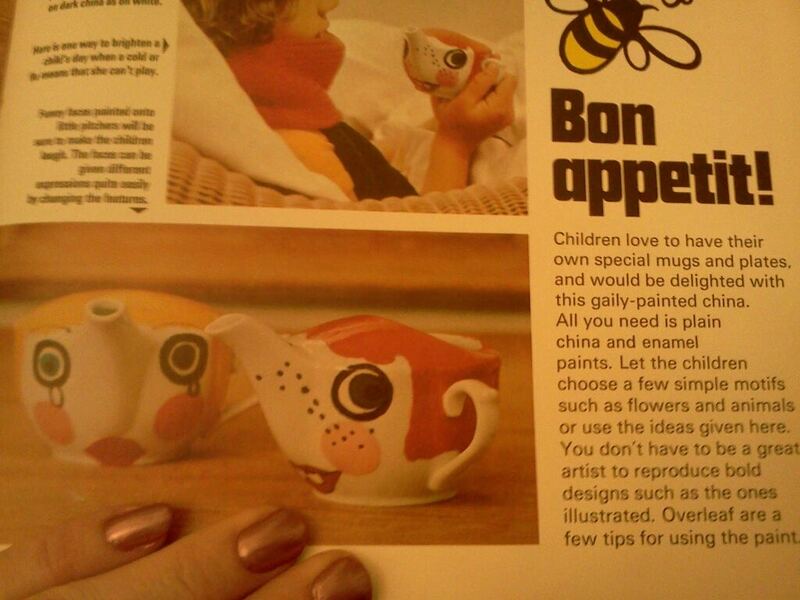 A terrifying teapot perfect for any tot. 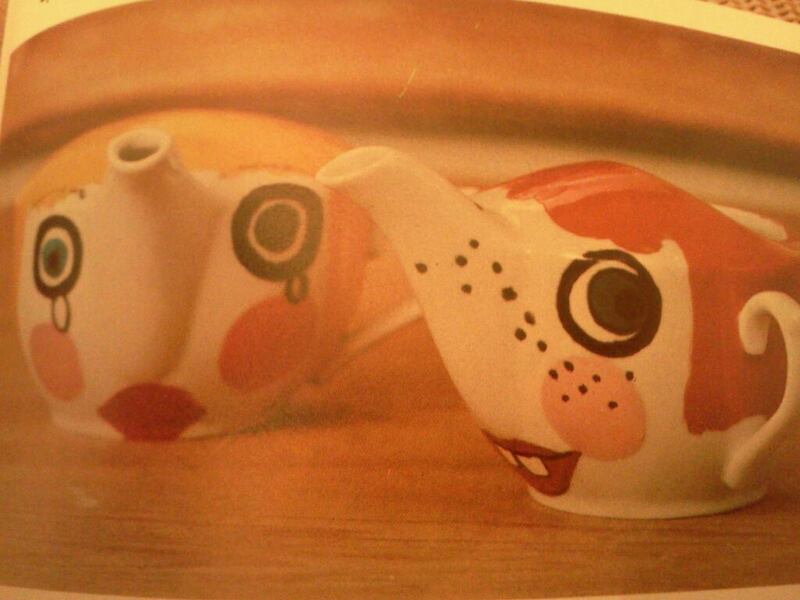 Just make sure the teapots looks like demons and one of them is crying. 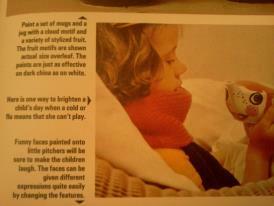 Here the picture discusses how much children love these hand painted china pieces, especially sick children. This is cruel beyond measure. As if the child might not be hallucinating enough from fever, add to their agony with one of these demon chalices. Probably filled with cod liver oil, if I remember correctly from my own nineteen seventies sick child experience. Shudder….sleep well, young one! We won’t ever blink. EVER! 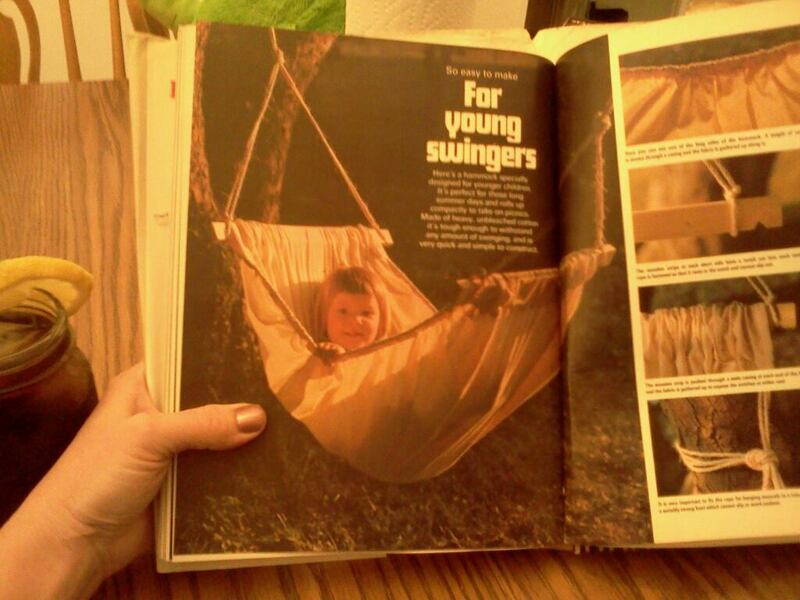 I don’t know how to interpret a craft project for “young swingers” from an era of “swingers.” If that is bad enough, this simply looks like a death trap. Could this even be made today? The liability! The lawyers are already on their way. Where are the seat belts? The whole project is constructed from hangman’s rope! That poor tot is even tied in a tree! Rock a bye baby, indeed. We all know how that song ended. What is wrong with these nineteen seventies people! How did any of us survive that decade? Well, I’m completely exhausted. I’ve been horrified to the core of my being, and now sit shaking on the couch. 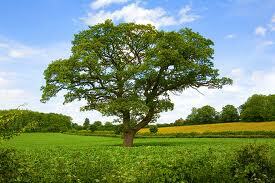 Those poor trees, shining, bright and mighty. They did not deserve to be tattooed with these photographs forever. But they did so for the sake of art. This entry was posted in Uncategorized and tagged 1970's, antiques roadshow, best seller, books, crafts, cruel, folk art, home decor, horrifying, humor, humour, macrame, new york times best seller, nineteen seventies, published, publishing, publishing company, puppetry, shurnken apple heads, writer, writing. I am not kidding when I tell you that I think we had this book. My mother probably wanted my father to build that swing thing. Seriously. LOL! Glad he didn’t do it. Doesn’t exactly seem to fit up to standards for child safety. Ha ha, those teapot things are weird but… I want! Well the instructions are all within this book. Do you want to borrow it? LOL!